Among the range of all the different design philosophies and styles that have found their way into mono.kultur over the years, it’s the quiet, unobtrusive approach that we sometimes enjoy the most. 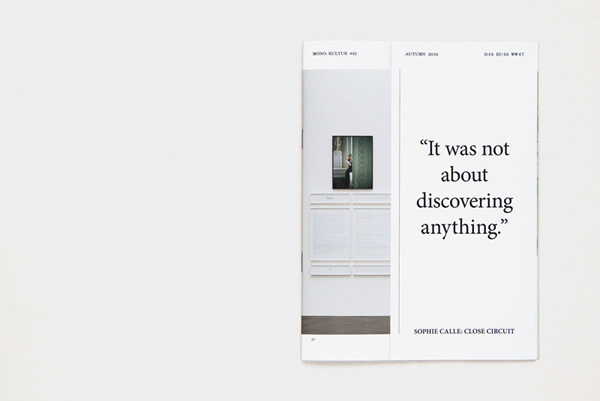 Idem for our still current issue with and about Sophie Calle, designed by the wonderful Wuppertal-based designer Stephanie Passul. Almost museal at first sight, the issue plays with the artist’s penchant for structure, divided between the public in a highly aesthetic display of selected works that borrows from Sophie Calle’s unusal style of arranging artworks on the wall, and the personal with a very frank conversation set in a different shade of grey. But of course, as with all things well thought through, the magic lies in the details, in the little interactions and references that occur between words and images, as well as the frictions they generate. 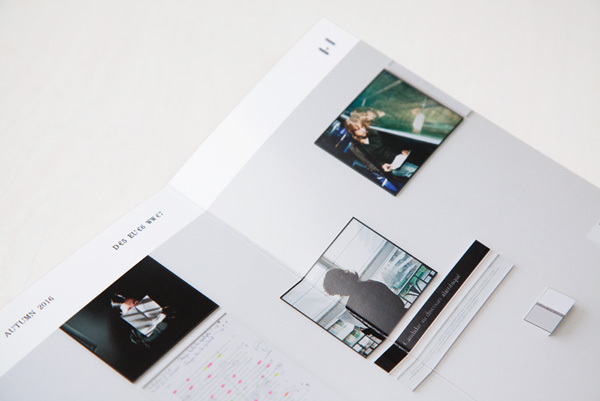 Take, for instance, the cover which boasts in large letters our title quote ‘It was not about discovering anything.’, when, of course, the fold-out cover just begs to be unfolded to reveal the full image underneath. Just a case in point for an issue that might appear serious and quiet at first in its shades of white and grey, when in fact, there is a whole world of play to be discovered. Not much unlike the work of Sophie Calle, in other words. This was written by kvr. Posted on Wednesday, February 22, 2017, at 14:50. Filed under design, mono.kultur. Bookmark the permalink. Follow comments here with the RSS feed. Post a comment or leave a trackback.